If I skip the media restore, and continue backing up the chat history, will I be able to restore the entire chat history and media on my iPhone X when I get it back? 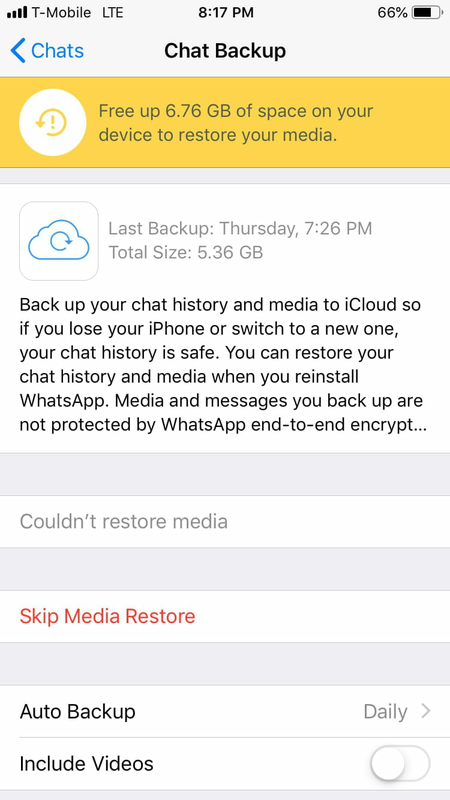 Will the media part of the backup be erased from iCloud if I skip media restore and do a chat history backup on the temporary phone? Why do all of this temporary work? Assume you will not be able to restore to multiple devices, and the cloud will be destroyed once you apply onto a device. consider this a security stop gap! I only use WhatsApp on one device at any time and that makes sense for security purposes. But I should be able to backup and restore to multiple devices when I swap between them, not all at once. Not sure if I'm missing something. What does it mean 'cloud is destroyed when I apply onto a device'? The WhatsApp data is still on iCloud when I restore from a backup and use it on a device. I know that backups done from the same device are cumulative but I'm just curious how it works for multiple devices. What does whatsapp say? Why not just try it then, if you are confident. We cant answer for whatsapp. I was only saying why do temp work. You seem to know what you are doing. If you really want to know, contact whatsapp! I did and haven't got any response for a long time. Hence asking in forums. Thanks anyway. Based on your replies, I do not think any thigg bad will happen. As I said, it seems you know what you are doing.